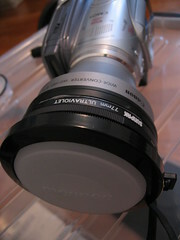 The WD-H43 has no filter ring and uses a strange cap size. 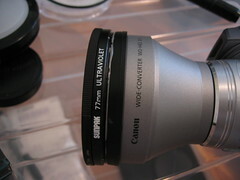 As it is there is little to protect the nice high definition lens from stray projectiles, sea spray, leaves, and twigs. I like to shoot outdoors romping merrily through grass, twigs and branches while grown men with toy guns lob tiny plastic pellets at upwards of 280fps. Needless to say I was worried for my lens. So I asked around but found no easy answers to solutions. Someone did point me to a CAVision lens clamp to adapt 75mm lens, the WD-H43 is 74.5mm which is close enough, to 77mm which I ordered from my favorite camera store. That was late September 2007. It's been on backorder since then and delivery won't happen until middle of 2008 if all goes well. Naturally I was frustrated in not being able use the lens with the great abandon I prefer. I tried a few ideas to hold a filter including using rubber plumbing parts. Finally I've come up with an interim solution that works. I use a spare lens cap for the WD-H43 and then cut out a hole for the lens. 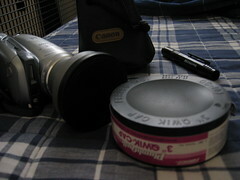 I glued a 77mm filter ring on to it then mounted my choice of 77mm filter. 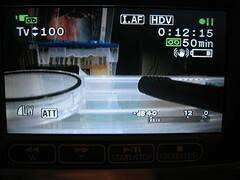 In this case I chose a low profile 77mm UV multicoated filter like those used in DSLRs. I did some experiments on how deep a stack I could use without the rings showing in the footage and the most it might do ('m guessing) is two. It would be three if I kept the glass on the glued on ring but I didn't. 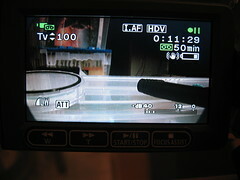 I shot test video which will be posted at a later date. Update: The LCD doesn't show the overscan area so it appears that more than 1 ring on the stack would be visible in the footage. Not one wanting to crop good video out, I put the filter glass back on. For now here's some pictures to give you an idea of what it looks like.